Whittlesey AA have been running regular matches on the Carrot Wash section of the Fenland drain at Pondersbridge on Saturdays throughout the season and it rarely fails to produce good sport. In the latest match on the venue it was Jeff Tuttlebee taking the honours. Drawn next to the bridge, he alternated between the whip and waggler and caught small roach, rudd and perch all day on maggot to finish with 11lb 14oz. Not far off the pace was runner-up Mel Saggers on the opposite end of the match length. He started trying to catch small fish but after a difficult early spell he decided to switch to a chopped worm and caster line which produced four tench for 10lb 8oz. Third place went to Roger Biddle, who had two decent tench and a few small fish on worm weighing in 6lb 4oz. 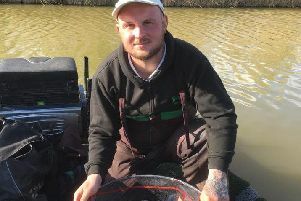 Leading the way in the latest Haddon Lodge Fishery Sunday Open was Cliff Fuller with 10lb 4oz. Runner-up was Martin Quelch on 8lb 9oz then came Tony Moulds on 7lb 6oz.